Abstract: High-quality Monte Carlo image synthesis requires the ability to importance sample realistic BRDF models. However, analytic sampling algorithms exist only for the Phong model and its derivatives such as Lafortune and Blinn-Phong. This paper demonstrates an importance sampling technique for a wide range of BRDFs, including complex analytic models such as Cook-Torrance and measured materials, which are being increasingly used for realistic image synthesis. 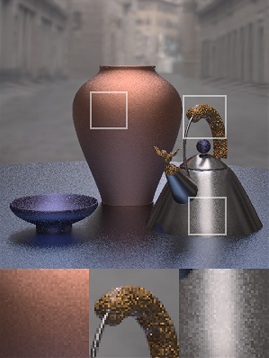 Our approach is based on a compact factored representation of the BRDF that is optimized for sampling. We show that our algorithm consistently offers better efficiency than alternatives that involve fitting and sampling a Lafortune or Blinn-Phong lobe, and is more compact than sampling strategies based on tabulating the full BRDF. We are able to efficiently create images involving multiple measured and analytic BRDFs, under both complex direct lighting and global illumination.